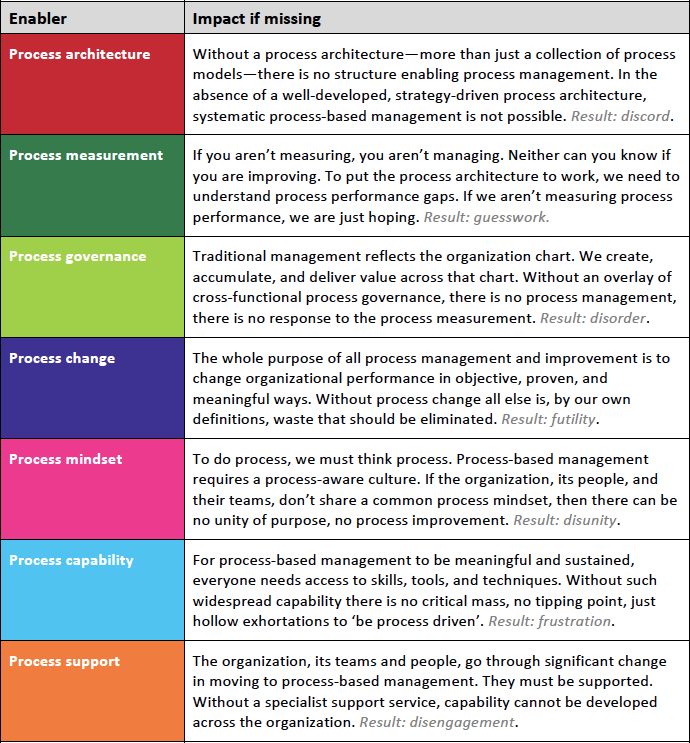 As some readers will know from my previous writing, for example here, there, and everywhere, I take a broad view of BPM, seeing it as a management philosophy, preferring the term process-based management over business process management. A brief summary of that view is as follows. An organization's resources are managed 'vertically' via the organization chart. Value is created, accumulated, and delivered 'horizontally' across that chart, i.e., via cross-functional processes. Value is accumulated across, not up and down, the functional organization as the various parts collaborate to create, accumulate, and deliver value in the form of a desired product or service. It follows that an organization executes its strategic intent via its business processes. In this context, where cross-functional processes are key to the delivery of value and execution of strategy, the improvement and management of processes is critical to the optimization of an organization's performance. BPM is not a one-off project, nor an IT system; it is a management philosophy. Discovering, documenting, improving, and actively managing cross-functional business processes exposes opportunities for getting more and better work done with the same, or perhaps fewer, resources. The power of process-based management is in understanding how work gets done and, based on that understanding, eliminating impediments, streamlining activities, and removing waste. The focus is on how the processes, including all the people and resources involved, deliver value to the customers and other stakeholders. This cross-functional focus is missing in most organizations, where it is replaced with an internal management emphasis guided by the organization chart. Providing support to develop, sustain, and realize the benefits of process-based management — Process Support. These seven enablers are shown in Figure 1. Figure 1. 7Enablers of BPM. A Mobius strip is used to highlight the interdependencies between the elements and to emphasize that all are important, and each is necessary but not, by itself, sufficient. These 7Enablers of BPM come together to create and sustain process-based management. If developed simultaneously at a pace appropriate to the organization, these elements significantly increase the likelihood of creating sustained process-based management. The 7Enablers is a collective of mutually-supportive prerequisites for successful and sustained process-based management. The core artifact is the process architecture since documenting the key processes is the necessary first step. Once documented, process performance measurement targets can be established, and governance arrangements defined to show who should respond to performance gaps and opportunities. These first three enablers (architecture, measurement, governance) are the 'physical infrastructure' on which the rest is built. 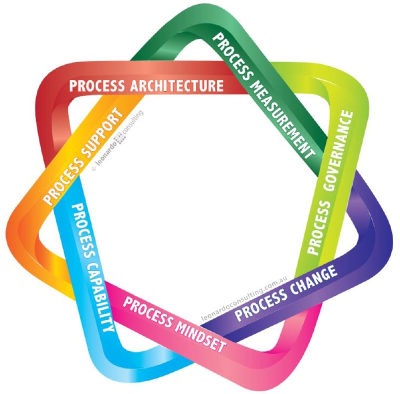 Continuous process change is the cornerstone of process-based management. Without process improvement, and its companion process 'innovation', all else is waste. For process management and improvement to become ubiquitous, it must be embedded in the organization mindset. Having a central specialist group to do all process work does not scale, and it is necessary to build the capability for identifying, analyzing, improving, and managing business processes throughout the organization. Coherent support is required for all involved. Much has been written (see previously-mentioned references) about the effect of each of the enablers, and of the full set, on achieving and sustaining process-based management. To further understand the nature of each enabler, it is instructive to consider what happens if an enabler is missing or not working properly. What are the consequences of a missing enabler? In Table 1 we consider the impact of each enabler (alone) being missing from the management mix. 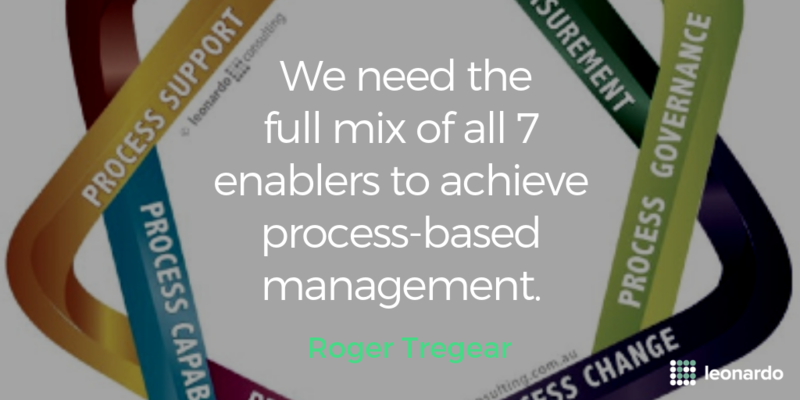 To achieve and sustain process-based management we need the full mix of all seven enablers to be developing together. Lose any one of them and the balance is upset, leading to failure. It is not enough to just hope that each enabler will develop automatically. A proactive plan and tracking mechanism are needed for each enabler to ensure success. Any missing enabler will stop the development of process-based management. Roger is a Consulting Director with Leonardo. He delivers consulting and education assignments around the world. This work has involved many industry sectors, diverse cultures, and organization types. Roger briefs executives, coach managers, and support project teams to develop process-based management. 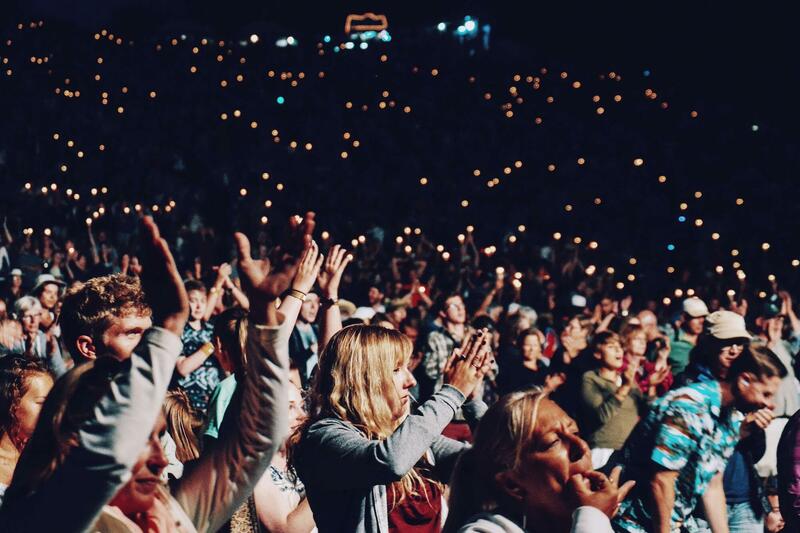 Several thousand people have attended Roger's training courses and seminars in many countries - and Roger frequently presents at international business conferences. Roger has been writing a column on BPTrends called Practical Process for over 10 years. This led to the 2013 book of the same name. 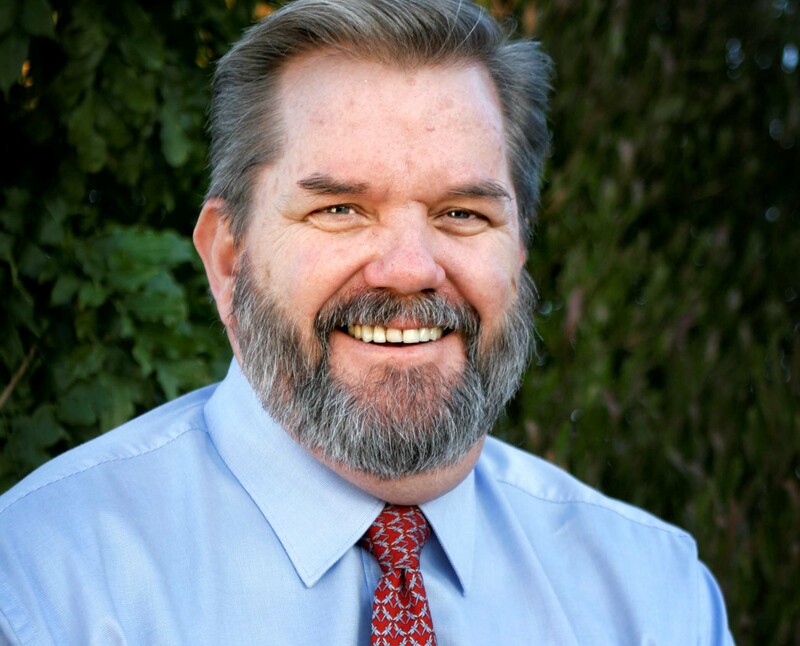 In 2011, he co-authored Establishing the Office of Business Process Management. He contributed a chapter in The International Handbook on Business Process Management (2010, 2015). With Paul Harmon in 2016, Roger co-edited Questioning BPM?, a book discussing key BPM questions. Roger's own book, Reimagining Management, was published in 2016.